Recorded live and released by Deroy record label in a pressing of 100 copies (of which apparently only two are now said to exist) in 1972, this self-titled work is the sole album of UK psychedelic prog jazz rockers Motiffe. Revolving around brothers John and Mark Pasterfield, the group’s personnel changed a fair bit during its short life and by the time the album was released, the band had already broken up and the various members had gone their separate ways to find fame and fortune. The most outstanding ex-member was guitarist John Grimaldi who formed Flux and various other bands playing jazz rock, and wrote and played music until his early death from multiple sclerosis at age 28 years in 1983. There are five tracks of mostly instrumental music featuring guitar, piano, saxophone, drums and flute, starting with the shortest, most structured and pop-friendly pieces “Grotesque Piece” and “Analogy”, where the melodies are most clear and listeners can even predict what’s going to happen over the next ten seconds, to longer, more meandering and less structured tracks. While the music is energetic and even soulful at times, the long tracks do suffer from a lot of self-indulgent guitar and any interaction from guitar and saxophone, or from guitar and flute, or even from flute and saxophone, tends to be more meandering and less spitfire competitive. The home-studio production quality level perhaps blunts the sound so that it is less sharp and vibrant than it should be, and there are long passages where the music seems flat due to the poor quality sound. On the upside, the production quality adds a dark, forlorn mood to the music, especially in the last few moments of “Life Reciprocal” where the sax-dominated music with the meandering bass acquires a smoky flavour. Virtuoso guitar playing is highlighted across all tracks, the long loose ones like “To George” and “Mind & Body” in particular. There’s less flute and saxophone than I would have expected on a prog jazz rock album like one – I’d have thought the sax would be the lead instrument right across one track. The music on the vocal parts on “Mind & Body” has a slight energetic Latino feel – this is where the production quality really lets down the track, the energy and zest and the hard edge of the music being less than what they should be. 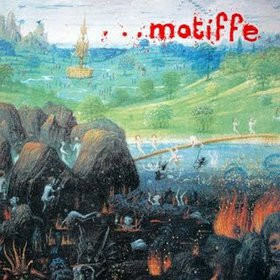 Even though there’s considerable filler here, Motiffe’s one and only album makes for quite good listening. If you happen to be in the mood for some (perhaps unintentionally) slightly dark progressive jazz rock, try giving this work a spin.